In advance of the artist's upcoming exhibition Kissing Trees, Bau-Xi Gallery sits down with Darlene Cole to learn more about her process. To offer a deeper perspective on Cole's conceptual touchstones, we asked her to comment specifically on one painting from the exhibition which captures the essence of this latest series. Q: Your recent series “Kissing Trees” is, in your words, an exploration of the “wildly private”—the feeling that nature is a “room” or interior with its own sense of comfort and intimacy, but also an element of play, or danger. The figure in this painting—“Kissing Trees (stepped on a feather bed)”—appears to be inside a semi-abstract world of nature. Where is she? What is she thinking? Darlene Cole: There are particular trees that I visit often in the historic parts of neighbouring towns. Every Saturday I walk by a pair of magnolias…which I believe may be evergreen magnolias (they had some blooms in September and still have their leaves in November). In full bloom, these trees are all-encompassing; I wanted this painting to have the feeling of a union between the figure and the canopy of the magnolia. There is very much an abstract quality to the blooms, and when I stand back there is such a haunting beauty to them as they converse with one another. I wanted to come closer to the Magnolia as I was painting, as if to preserve and protect it. At the same time, the figure could be viewed as the protector of the tree—a reciprocal relationship that works when both sides are listening. Q: Do you have ‘characters’ in the exhibition—I am thinking particularly of the woman in “Kissing Trees (unravel)” who wears a period hat in a three-quarter pose. I know each painting is a ‘relative’ of another, so wonder if this work has any companions. Darlene Cole: The figures in “Kissing Trees” are wrapped up in textures/fabrics. The hat in “(unravel)” echoes the unraveling of silk or velvet ribbons and flowers. Rather than looking into the past, I wanted to contemplate the future with the simplicity of the blush background. I hope that all of the paintings in my show could be companions with one another in conversation. As I work in the studio, it is part of my comic relief to pair paintings side-by-side — often introducing two very different paintings—only to find to my surprise a great quirky conversation. Cole's first concept sketch for "Kissing Trees"
Q: What is your relationship to palettes? In this piece, light, airy rose is anchored by deeper, mossy tones. The balance of values seems to say something about the narratives which inform your work. Can you speak to this marriage of form and story a little bit? Darlene Cole: I think that there is a conscious tension—a mystery that I am layering in each painting. Q: Can you tell me about the title: both “kissing trees”—which is your series title—and “(stepped on a feather bed)”? Darlene Cole: We were driving on some back roads in a rainstorm. The rain was creating streams of water in the mud and the wind was bending the trees as they canopied over the road. In the fury of the storm I couldn’t help but think that the trees were comforting each other as they “kissed” over the road. There was something cinematic about it all, like an orchestra building to a climax. “(stepped on a feather bed)” is like hitting that moment of calm when you are caught in a moment. The feathers allow you to pause and sink in. I’ve always been intrigued with the interior existing in the landscape. The feather bed is a reference to that. 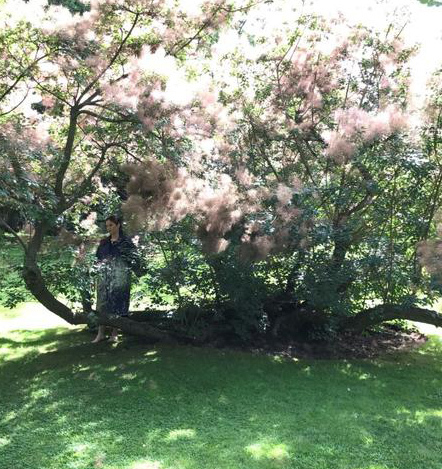 At a nearby estate, I experienced a smoke tree in full bloom. I went back a couple of days later with my paint smock and walked around the bowing branches in my bare feet. The sensation of the moss under my feet and the “smoke” around my head transported me. It is this union of nature and humanity—landscape and figure—that transcends me and makes me aware of the fragility of nature and how important it is for our bodies to listen and to feel nature. “Kissing trees”—they are whispering to listen, to feel, to protect. Q: The magnolia motif has appeared before in your paintings; what is your relationship to this imagery? Darlene Cole: The magnolia fascinates me—hauntingly beautiful, the duality that it represents: fragility and strength. The blooms of the magnolia were pollinated by beetles because the trees appeared before bees did. Q: Each of your paintings incorporates a marker of innocence—a child, a rabbit—some signal to memory. What is your marker in this latest series? Darlene Cole: Kissing Trees incorporates a few markers: the rabbit, a clock, palm trees, and a crazy quilt— one that was left unfinished that I purchased from an antique dealer while working on this body of work. I see the quilt as a reference to Canada’s recently celebrated history, and particularly to women’s labour. I can feel the quilt in present tense more so because of its raw state and I see beauty in that. Many of the quilt’s colours are echoed in this show, the velvets particularly. We recently sat down with artist Darlene Cole for a conversation about her upcoming exhibition, 'The Intimates'. How do you approach creating a new series? b) I find that working on a small scale in the beginning gets me to the gritty raw bits of what I want to say and feel... I immediately know if it has the push and pull that I want. c) I draw from what is around me, human to human, relationships, pathways, landscapes, visits to antique shops in Old Ontario, my artist retreat, etc. For 'The Intimates' I bought a new Moleskine sketchbook and some yummy chalk that feels like I'm on a boat when I work with it. It is a green/grey blue...like a wild lake colour. I've been drawing (rather habitual) while standing at an old table that came from a historical building in Belleville, Ontario. The table is painted in an 'as found' glossy blue/grey colour that I can see the shadow of my hand in as I draw. Although I'm a bit of a nighthawk, I draw only during the day under natural light. It is an intimate experience with the music, daylight, the soft chalk on cream paper on the old table. How do you know when you've chosen the perfect 'theme' for the show? I keep bits of green masking tape on my walls in the studio...words or phrases that often have dual meanings. I might hear words in songs as I'm working, or often they just come to me at odd times...unloading the dishwasher or drying my hair. My work is truly on my mind all the time...like fine webbing that joins one thought to another as I move from space to space. The title for the show has to feel right in my space as I walk around this old house. It has to feel right with the ceiling height, the light filtering in...it is like part of the plot somehow or a hint of the setting...it has to 'fit' into my world...and make your cheeks blush a bit when you think of it. What element of your work do you visualize first? The feeling...the atmosphere of the painting. How long will you work on paintings for 'The Intimates'? Which elements of your familiar imagery will turn up in this show? Do you have any surprises for us?